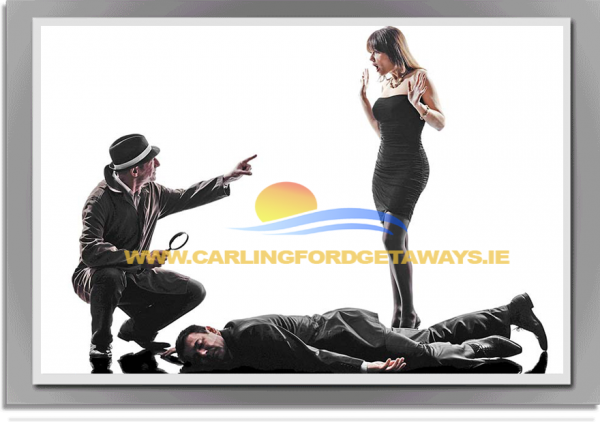 You’ll all become detectives for the evening as our professional actors play out a murder mystery drama in your midst while you wine and dine. A fantastic evening of fun, hilarity and some good old fashioned detective work! •	This event is run over the course of a sit down dinner. •	You are greeted at your chosen venue (which we will liaise with and book for you) by a larger than life character known as ‘The Don’. He will set the scene for the evening ahead. •	Just as dinner begins, a murder occurs (of the actor of course!!!) But don’t worry, he then returns as a detective to explain what’s going on and get your investigative juices flowing! •	Your task is to find out who killed ‘The Don’! •	Each of your friends gets a ‘character card’ outlining who they are for the duration of the game, don’t worry no one needs to be Meryl Streep – our actor takes care of that. •	Clues are brought by a series of unusual (to say the least!) characters as the night progresses. Witty banter and top class laughs are always on the menu! •	Using some info that we will have got form you before the event, we will personalise the event for you, incorporating some funny stories about the bride and her friends as part of the plot. •	One of you is the murderess and your friends have to interview each other throughout the dinner to find out ‘who dunnit!’ by the time we get to dessert! •	Of course the crime is always solved, the best case presented to our detective wins a bottle of fizz. •	For larger groups and bigger budgets – we have 2 and 3 actor versions of this as well as different themes, just ask for details when you make your enquiry. The night is fun, funny and a really memorable way to celebrate your hen party.